International credit ratings agency Standard & Poor's has declared Venezuela to be in "selective default". The ratings agency said the South American nation had failed to make $200m (£153m) in repayments on its foreign debt. Venezuela's state-run oil company PDVSA has also been declared in default by rating agencies Fitch and Moody's. The news came just hours after the government met investors in Caracas to try to renegotiate its debt. Standard & Poor's declares a "selective default" when a country has failed to pay one or more of its financial obligations when it came due. In the case of Venezuela, the government of President Nicolás Maduro failed to make $200m in payments on two global bond issues by 12 November, when a 30-day grace period expired. S&P says Venezuela is also overdue on four other bond payments worth a total of $420m but that the grace period has not yet expired on those payments. Venezuela's total external debt, which also includes loans from countries like Russia and China, is thought to be as much as $140bn. On Monday, government officials met with creditors in Caracas in an attempt to restructure its debt. But creditors who attended the meeting told journalists that the 25-minute meeting ended without the government making any concrete proposals. Instead, the head of the Venezuelan commission, Vice-President Tareck El Aissami, read a statement blaming sanctions imposed by the United States for Venezuela's difficulties in making the payments. Mr Aissami, who has been accused of drug trafficking by the US, is himself on the list of Venezuelan individuals sanctioned by the US treasury department. Participants in the creditors' meeting said at least one attendee left the room when it became clear Mr Aissami would be leading it. 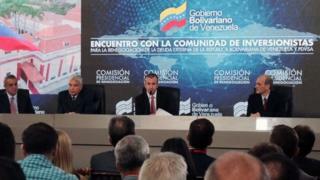 Under the sanctions, no US citizen can do business with Venezuelan individuals on the list. The sanctions also impose a ban on US entities buying any new Venezuelan debt issues, complicating the government's debt restructuring plan. The Venezuelan government described the creditors' meeting as "a resounding success" and said that it would continue to service its debts.